My name is Patricia Winter and I live in Indiana near the Dunes of Lake Michigan where I gather mermaid tears (sea glass) and inspiration for my work. I am a crazy quilt addict and enjoy stitching in my garden every chance I get. I have always been crafty and since childhood, I’ve collected old buttons, broken jewelry, laces, miniatures, and anything that caught my fancy that I could fit in my hope chest. The love of old things and found items has proven to be training for my passion, Crazy Quilting. In the 1980’s I cross stitched hundreds of designs, made 12 pieced quilts by hand, and tried several other crafts. All were interesting at the time, but nothing has captured my interest and kept my muse content like Crazy quilting has. 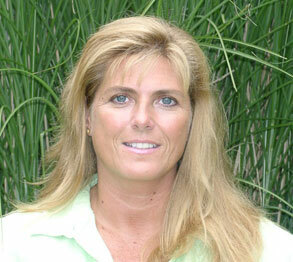 My first book on CQ was by Judith Baker Montano. It caught me hook, line,and sinker! Although I enjoy doing my own thing and rarely use patterns, I have every publication of hers to date for when I need inspiration. My passion for crazy quilting truly was kick started from grief over the loss of my father in 2001. 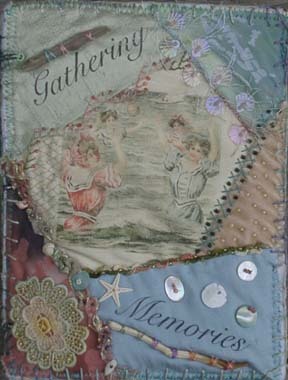 I gathered family photos and mementos, fabrics, threads, etc., and threw myself into making a sea theme personal fiber book with crazy quilted pages, not knowing what I was doing or what it would become. Much to my surprise I submitted the finished book to Quilting Arts and it was not only published, but made center fold!! Being self-taught with no formal art training and lacking self-confidence, this was a total shock and I thought it was a mistake until I actually had the magazine in hand. Several emails and phone calls later from strangers telling me how my book touched and inspired them to make one themselves, made me realize I could possibly have something to offer. This was the beginning. I was asked to write for CQMagonline by the late Nora Creeach in 2003 and just stepped down last month to make room for new ventures. Unfortunately I am a bit of a social phobic; however, whenever possible, I lecture and teach classes locally to build new interest in this beautiful art as well as answer questions online to curious minds. I love introducing CQ to children. They enjoy playing with beautiful fabrics, threads, beads and baubles just as much as adults do. 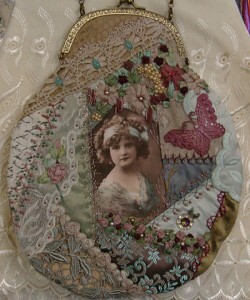 The past 8 years I have been using the crazy quilt method to create purses, jewelry, wall hangings, pillows, etc. I prefer making useful items instead of wall hangings. My theory is, you put so many hours into a project, why not use and enjoy it daily? I cannot seem to stop creating and my mind is always thinking up new ways to use CQ which I share on my web site, Pat Winter Gatherings. I entered my first contest in 2006 by submitting my CQ wall hanging, Life Within A Garden, to the $100,000 quilting challenge magazine and won the crazy quilting spot for issue #4 and was runner up for the grand prize. Since then I have had my work published in various issues of Belle Armoire, Haute Handbags, Sew Somerset, and art-e-zine. I want others to see how really simple it is to crazy quilt and it only looks intimidating. I love every step of the process, from dyeing and selecting fabrics and embellishments to sewing on the last bead by hand. 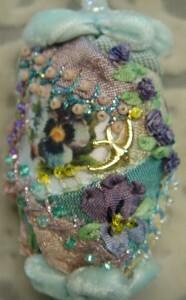 All of my embroidery and embellishing is done by hand. When a student tells me they have an embroidery machine, I tell them that is nice, and to not turn it on until they have finished their project. I blog because I enjoy sharing whatever I can, and I have found such a warm community of friends that I can’t remember life before blogging and can’t imagine life without it. To me it’s all about sharing. I join in charity projects when time allows. I really enjoy creating for a cause. I started another blog in 2007 and invited anyone and everyone to create and donate small 6" or smaller dolls to be gathered by the dozen and sent out to battered women’s shelters. The project is called,Comfort Doll Project, and I am proud and thrilled to say it is extremely successful and going strong. We have sent out 37 dozen Comfort Dolls within the US. I just received a box today from Jan Bartlett, who sends them by the boxful. There are so many faithful supporters and newbies on a weekly basis creating for this cause. Please visit the blog to see the wonderful donors and their creations. There are just too many to list, and I treasure and appreciate each donor. 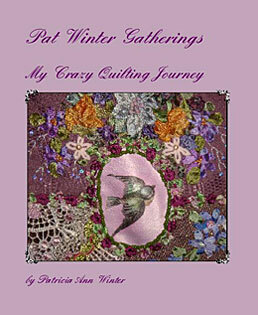 Last January, I self-published a book about my CQ experience titled, Pat Winter Gatherings. 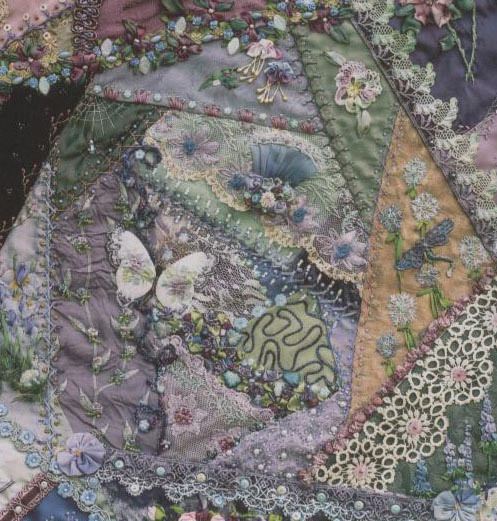 It is an introduction for those new to explore the elements and applications of a crazy quilt project. It was also meant for current crazy quilters to view many of my own projects for inspiration and to get to know exactly what I do and that I am just a happy crazy quilting gardener! 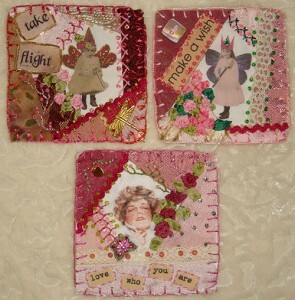 This year I hope to play with new products of all kinds and adapt them to crazy quilting. I also look forward to adding new hand-made items to my etsy shop. I have never met anyone famous for crazy quilting, although a few ladies who crazy quilt have come to visit me and we enjoyed talking about CQ for hours, but I would like to meet Judith Baker Montano one day. Although we have different styles, her art has captured my heart and given me endless hours of pure bliss. Now for a bit of fun and sharing! International reader’s welcome to participate. I would like to offer one of my mini crazy quilt pendants, Victorian Angel, as a prize to one reader who can answer this two part question correctly first. In what year was the first use of the word,"Crazy" used to describe a random, asymmetrical pattern in needlework and in what publication? To enter the contest: Leave a comment at Pat’s blog with your answer. Enjoyed your words……and the “joy” I sensed in your journey. So happy for you. May the very best be yours. Congratulations Pat on your CQ Journey. I am fascinated by your achievements and am inspired. I just love all you do and am overwhelmed when I see your pieces.. Your work is as beautiful as you are…. Sweet Pat ~ You have achieved so much yet something tell’s me this is only the beginning. Your sweet,kind and giving spirit can’t help but keep coming back to you by way of continued sucess. Thanks for being such a special part of my life! Patricia makes some cute quilts!